Where do you want to be part of the music? All Warren Township Grades 6-12 grade students have an exciting opportunity to participate in the Band, Orchestra, and Choir Music Programs! Band, Orchestra and Choir classes meet during the regular school day, and you receive a grade for your work. Instruction will be offered on strings, brass, woodwinds, percussion and voice. Participating in a choir, band, or orchestra provides a wonderful opportunity for your child. Music students consistently have a higher GPA (grade point average) than most other groups of students. Your child will not just learn music skills. Your child will learn self-discipline, problem solving, goal-setting, self expression, memory skills, concentration, poise, enhanced physical coordination, high self-esteem, and the importance of teamwork. All of these skills will be very useful for the rest of your child’s life. Student band, orchestra, or choir experience will continue through middle school and high school with many performance opportunities. Students may also choose to take private instruction with a professional in addition to their regular music class to further their skills. There are many opportunities in music after high school. Some colleges and universities offer scholarships for music participation even if it is not your major area of study! Playing an instrument or singing has a profound effect on academic success. If you are interested, please visit the sites above and complete the interest form within. If you have already turned in your course selection sheet and did not choose band choir or orchestra, it is not too late to change!!! 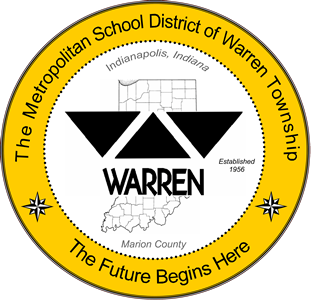 Simply contact the middle school and let the counselor know that you would like to be in Music in Warren Township. Band, Choir and Orchestra are performing groups, as well as academic classes in Warren Township. Because they are performing groups, attendance is mandatory at approximately 4 after school rehearsals and 4 programs per group per year. We encourage students to participate in as many other activities at school as they wish. Many clinics with directors and performers from outside the District are offered to students throughout the school year, to widen the student's base of experience. We also take music field trips (when possible) for this same purpose. On the lighter side of things, many social events are centered around the Music Departments, including (but not limited to) dances, pizza parties, picnics, skating parties, Kings Island trips, etc. Music enriches life; it is a way to understand our cultural heritage as well as other past and present cultures.